Warning: be very careful with making assumptions about YHCHI, because just when you think you have figured them out, they switch things around on you and surprise you with a twist on their deceptively simple style. 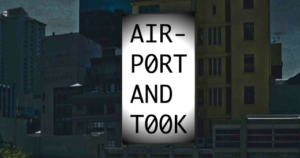 This 2011 poem breaks with the minimalist white or single color background to actually provide a photo of an urban landscape. In the center of that backdrop, they place a rectangular square, almost as a screen erected for an open-air screening of their work, an idea reinforced by the dark corners where the projection can’t quite illuminate as effectively. Another significant variation is that the rectangle is placed vertically, rather than horizontally as is the case of most of their works (a shape favored by both cinema and computer screens), a producing narrow canvas that they acknowledge by breaking words with hyphens when they don’t fit in the space, and sometimes when they do fit. Finally, this piece uses original jazz music to pace a text about people in urban spaces, and how these spaces shape both the concept and pleasure of the place.